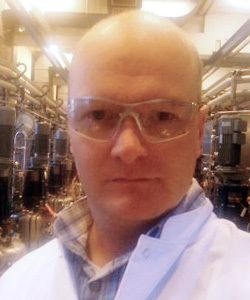 Stuart is presently a Senior Principle Scientist at LEO-Pharma A/S, Denmark. Stuart holds a BSc in biochemistry (Manchester University UK, 1990), and an MSc and PhD in Biochemical Engineering (University of Birmingham UK, 1997). As research fellow at Birmingham, he was the first to measure the mechanical breaking forces of actinomycetes (1997-2000). In 2001 he & his family moved to Denmark when he started as a fermentation scientist in Novozymes’ fermentation pilot plant. After 15 years and dozens of collaborations and interactions on product intros, supporting new business activities, and collaborating on projects with academic partners, Stuart was Senior Technology Specialist. During this time Stuart also assisted with organising conferences, became an Editor at Biotechnology Letters, has 25 publications, holds 2 patents, supervised many students and given several lectures. He was also influential in the creation of the company, Freesense(.dk). Stuart is a Fellow of the Institution of Chemical Engineers, is a Chartered Engineer, and also has a role as Visiting Professor of Industrial Microbiology at Aston University, UK.